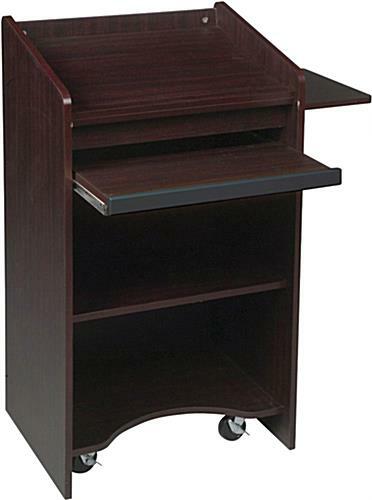 These wheeled mahogany pulpits are made of sturdy wood and feature an interior shelf and angled reading surface. 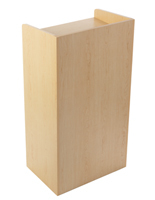 The podiums also offer a convenient sliding tray for a keyboard or notebook. 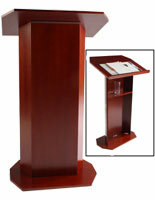 Moving the mahogany pulpits is easy with the (4) recessed casters, (2) of which lock to create a stable footing. 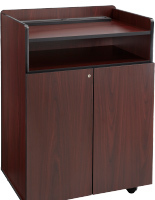 The wood lecterns look professional and make create great speaker's stands for universities, conference halls, and offices. 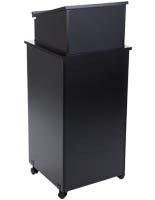 The pulpits with a sliding shelf have a 23.5" x 17.5" reading surface that can hold laptops, books and other presentation materials. 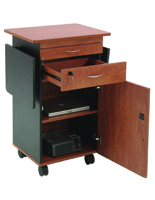 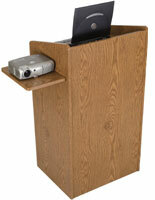 The stylish podium are also available with a lighter oak finish.